It took some serious remodeling, but new Hayden School District Superintendent Trudy Vader is enjoying her office and role. Hayden — The past 35 days have felt longer than five weeks for new Hayden School District Superintendent Trudy Vader. It only has been a month and some change since Vader took over the top district post in the wake of Mike Luppes’ resignation. But even with the first day of classes still 28 days away, Vader said learning her new role already has seemed like a lengthy, but rewarding, process. 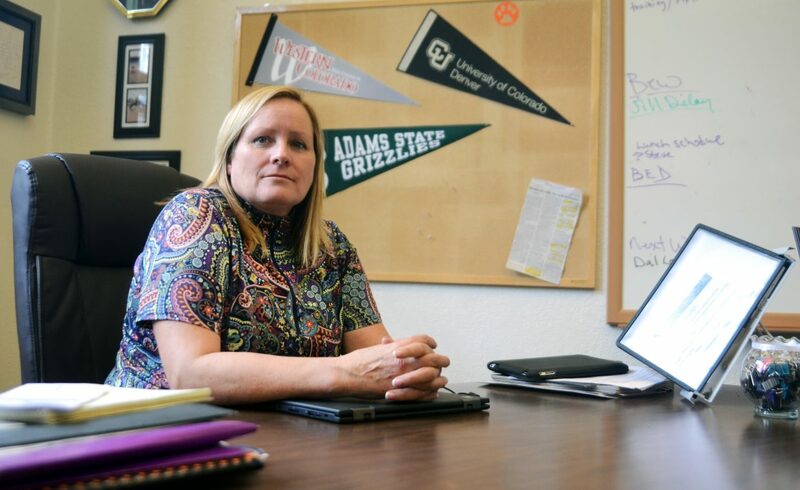 In her transition from being principal at Cripple Creek-Victor Junior-Senior High School to becoming Hayden’s new full-time superintendent, Vader said Luppes played an integral role in her training. Vader called the jump from Cripple Creek to Hayden the smoothest transition she ever has made in her career in education. Luppes served two stints as Hayden’s superintendent, first in a full-time role and, most recently, in a part-time position. Vader said she already has the first four to six months circled on her calendar as a time period to heavily engage the Hayden community. One of her first priorities will be to revamp the district’s vision with regard to its strategic plan and create a solid mission statement that reflects a bond between the educational and community side of Hayden. Another line of business that Vader could play a role in actually began before the superintendent’s July 1 start date. Since the end of the 2013-14 school year, the Hayden School Board has been in the middle of discussions regarding the expiration of its 2010 voter-approved property tax increase, which passed by just 10 votes four years ago and has generated about $320,000 annually for the district. With the mill levy override due for potential renewal, Board President Brian Hoza said the board voted at its July 16 meeting to reserve a spot on November’s Routt County election ballot as board members continue with budget discussions. Hoza said the 2010 property tax increase was critical during a financially difficult time. It helped the district keep its salaries competitive, and it allowed the district to avoid dramatically reducing its number of employees. The revenue also stimulated a painfully low fund balance, Hoza said. The property tax increase was set at the highest the state would allow based on its override limitations, according to Hoza. He said Monday that he couldn’t speak for the board as a whole, but his current perception is that if the board votes to place a mill levy override extension on the November ballot, the district likely would need to continue at the current rate, revenue wise, in order to maintain its level of funding. The property tax increase approved by voters in 2010 has cost residents $24.79 per $100,000 of assessed valuation. It costs commercial entities $90.31 per $100,000 of assessed valuation. Although handling a potential mill levy override would be a first in Vader’s administrative career, the new superintendent said she would assist the board with the “what-ifs, positives and negatives” the best she could. Vader said she has been impressed with the board’s thoughtful discussions on the matter. “My job, I really feel at this point, is to support them in the process of their decision-making,” Vader said. Discussion on the mill levy override will continue at the board’s next meeting Aug. 18.